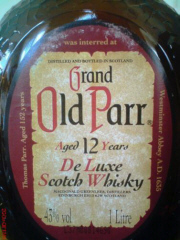 Launched in 1909 Old Parr Blended Scotch Whisky is traditionally known for its brown square bottle. Popular in South America and Japan where it is readily available. Still sold at 43% strength and it is a favourite of any who have sampled it.